The reference book on microaggression. Little did I know what pit of information I would have to jump into in order to put together that workshop. It didn’t matter that I’ve already read the three part publications of Dr. Berk on microaggressions (including a part on how to develop a workshop on the subject; Part 1, Part 2, and Part 3), I was about to open some doors that will never be closed again … and that was a good thing, can you believe it?! Sue, D. W. (2010). 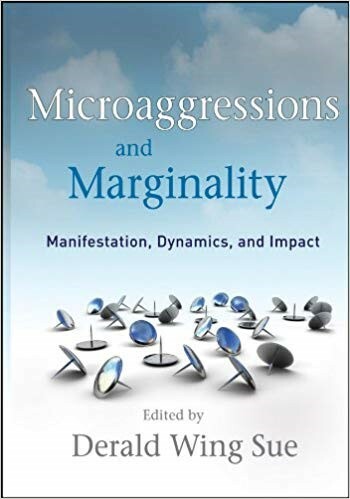 Microaggressions and Marginality: Manifestation, Dynamics, and Impact. John Wiley & Sons. Sounds pretty straightforward when put this way doesn’t it? Well, I’ve found part of this definition pretty vague and open for interpretation. For example, what constitute a slight? One can argue that this depend on the victim’s perception and one would be perfectly correct. The whole point about microaggression is to raise empathy and awareness of our actions on other human beings around us. I like to think of microaggressions as aggression due to the lack of understanding of one’s words and/or actions onto other. In that sense I’ve distanced myself from the “intentional” part of the aforementioned definition, I’m well aware of that fact. The image above provides some examples of microaggressions. It is by no mean meant to be exhaustive, microaggressions come in numerous forms and shapes, but it helps to start with some obvious ones that, to be honest, should really beg the question: “Do people really say that? !” Note that by asking this question I’m well aware that it speaks more to my privilege than to anything else (I’ve been sheltered from those behavior from my position of white male). However, I’ve felt my (small) share of microaggression and can relate to some of them. My “favorite” is the one below to give you an idea. One way to take your own temperature on microaggressions is to use the very handy inventories that have been put together by the community, namely the “Student Microaggression Inventory” and the “Workplace Microaggression Inventory.” Go ahead and click on the link that correspond to your situation and take a few minute to take the inventory. You’ll get a percentage of microaggression exposure that will probably surprise you. Well, one way to look at microaggression is through the lens of its actors: the victim, the aggressor, and the bystander (or ally, hopefully). Talk to the person privately to express the way you felt about the interaction following this handy template: calmly question the aggressor’s behavior by diplomatically asking a follow-up question (e.g., “Why did you interrupt me in meetings? I don’t interrupt you.”). Change the subject. This last resort solution, in my opinion, is simply meant to provide the victim with a way out at a minimum cost. Ideally, an ally would pick-up on what is happening and intervene or the victim can talk to the aggressor later about the incident or report it to a superior for mediation. As an aggressor, it is important to accept the blame from the victim and listen. What you will be saying to them after they are done asking about your behavior and/or expressing their feelings about your interaction can make or break the relationship between you two, so trade carefully. Equally important are those two things: listen then apologize. Apologies are way underrated, they are cheap, effective, and allow both parties to move on to address the roots of the problem(s) without emotional burden. Finally, as an aggressor you must respect the victim for their courage of speaking up, it takes guts to face the perpetrator of a microaggression directed toward them! So listen, listen, listen, apologize, work toward being a better human being, and thank whoever pointed your aggression to you (they provided you with the occasion to become better, this is a great gift that they gave you). Desire: State what you would like to have happened. The way forward is awareness, empathy, and kindness.